The QAV-XS Stretch FPV Racing Quadcopter is a Stretch-X, light weight, super stiff, finely tuned airframe designed for high performance FPV Drone Racing. This racing airframe is stripped down to the bare essentials without sacrificing strength and durability. The Stretch-X has outstanding handling characteristics on pitch for a locked in, high speed forward flight, and quick snap rolls. This version features an ultra-durable 4mm carbon fiber main unibody plate. The QAV-XS, like the QAV-X CHARPU, features a unique FPV camera and HD mounting system. The FPV camera is recessed partially below top plate and protected by the top cross bar, guarding your electronics. At the same time, the camera side walls act as an angled wedge to set your HD camera on for recording, such as a GoPro, at a 35 degree angle. No need to 3D print custom mounts to angle up your camera anymore, just add some of the included neoprene foam, securely strap down your camera and fly! The main “unibody” 4mm plate is CNC milled out of a solid sheet of premium carbon fiber. The outer weave of the carbon fiber runs in line down each arm of the QAV-XS (0/90 weave), maximizing the strength of the carbon and arms. The center layers are offset at 45 degrees providing even and balanced strength throughout the entire plate. The main plate and top plate have a chamfered edge on top and bottom giving it a nice finished look and removes any sharp edges. Each piece of carbon is cleaned and sprayed with a clear coat for a premium finish. There is no sanding required, and no messy carbon dust. The top plate includes an antenna SMA mounting hole, and cable tie holes allowing you to lock down your antenna in place. The top plate also has a cutout allowing access to your VTX button and LED displays for easy channel adjustment. The balancing bumps on the sides of the top plate make it easy to measure the center of gravity on your frame in the field to get the perfect balance. Stretch-X Compact size for 5″ propellers, 222mm motor to motor. Compatible with Lumenier Race Pod. 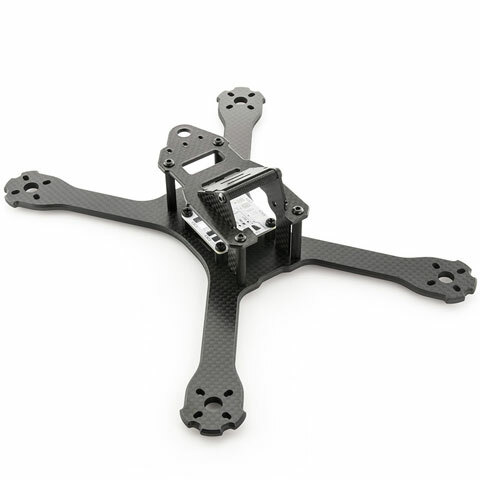 Airframe: 86g (airframe + hardware), 91g (with battery protector plate).